Among the most masterful and insightful of 20th Century economists, the Austrian economist Friedrich A. von Hayek alone could have stood shoulder-to-shoulder with his great rival, J.M. Keynes. Trained by Wieser and Böhm-Bawerk in the Austrian tradition at Vienna, F.A. Hayek nonetheless carved a distinct spot in the economic pantheon - in some ways more different from the Austrian School than that of his friend and intellectual companion, Ludwig von Mises. After some fundamental early contributions (e.g. 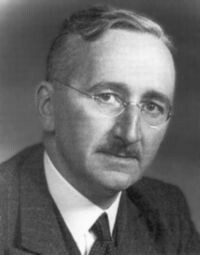 his 1928 article is often credited with having introduced the concept of a fully intertemporal equilibrium), Hayek's early work was primarily in monetary cycle theory (1929, 1931, 1939). Drawing upon the "cumulative process" of Knut Wicksell and a Continental tradition of multi-sectoral overinvestment models, Hayek argued that when finance permitted investment to be greater than savings, then both desired investment and consumption demand cannot be met by actual output - thus there will be "forced saving" and changing degrees of "capital intensity" (with capital conceived in a very Austrian sense) changing output and employment. However, forced savings are not sustainable as capital goods demand will not be maintained if consumer goods producers are being dried of consumption demand. Thus, there is a contraction in output and a subsequent fall in capital intensity. Hayek argued that this "concertina" process was the main motor behind business cycles. Hayek presented his main treatise on monetary cycle theory in a slim book, Prices and Production (1931), in England and was immediately drafted by Lord Robbins to join the L.S.E. - where he would serve as that institution's answer to Cambridge's John Maynard Keynes who was then working on similar issues. Keynes did not take lightly the criticisms Hayek made of his Treatise on Money (1930), and thus Keynes and Sraffa joined forces to bury Hayek and his cycle theory in the Economic Journal in 1932. At the L.S.E., Hayek was instrumental in furthering its then-novel "continental" bent and he was highly influential on his junior colleagues (such as Hicks) and students (which included Lerner and Kaldor). However, following the appearance of the General Theory by J.M. Keynes in 1936, Lerner and Kaldor, like the rest of the economics profession, were drawn away from Hayek's orbit. Kaldor's departure was particularly stinging - since his subsequent criticisms of the "Ricardo Effect" upon which Hayek was hanging the remnants of a shredded cycle theory, led Hayek to abandon his cycle theory entirely. Hayek's attempted to work a new system in his Pure Theory of Capital (1941), which he originally envisioned as a part of a larger work. In it, he attempted to develop a joint theory of investment and capital. Inexplicably, his 1941 book fell dead-born from the press and proved to be his last substantial effort in the area of theoretical Neoclassical economics. Nonetheless, many of the Hayekian capital themes would emerge later in the theory of investment by his students, notably Friedrich and Vera Lutz and Abba Lerner and, more distantly, Trygve Haavelmo. Hayek turned in 1944 to the political arena with his Road to Serfdom, a polemical defense of laissez-faire - the work for which he is best known outside academia. His subsequent political activities include the foundation of the libertarian "Mont Pelerin Society" in the 1940s. In 1935, Hayek had edited a book on the Socialist Calcuation debate in which Mises had been engaged. In resurrecting Barone's 1908 article, Hayek realized that the Mises attack on the socialist position was untenable. As a result, in several famous articles - notably, "Economics and Knowledge" (1937) and "On the Use of Knowledge in Society" (1945) - Hayek composed a response which advanced the "Socialist Calculation" debate to a new level. Succinctly, he claimed, countering Lange and the Paretians, that prices are not merely "rates of exchange between goods", but rather "a mechanism for communicating information" (Hayek, 1945). Hayek argued that people have little knowledge of the world beyond their immediate surroundings and this is what forces them to be price-takers - the crucial ingredient that makes the price system work. If, on the other hand, a particular agent's knowledge were greater, agents would then refuse to act as price-takers but rather make decisions in a way which would manipulate their environment to their advantage thereby destroying the price system. In a complex, uncertain environment, Hayek argument, agents are not able to predict the consequences of their actions, and only this way could the price system work. In Hayek's words, the "fatal conceit" of the Oskar Lange and other "Socialists" in the calculation debate was that they believed this order could be "designed" by a planner who just gets the prices right, without realising that a price system evolved spontaneously as a result of lack of knowledge. The same limited knowledge which afflicts the agent's predictive power must necessarily constrain the planner's as well. Hayek enhanced this argument with considerations of "spontaneous order" - the idea that a harmonious, evolving order arises from the interaction of a decentralized, heterogeneous group of self-seeking agents with limited knowledge. This order, he claimed, was not "designed" nor could be "designed" by a social planner, even a very wise one, but merely "emerged" or evolved spontaneously from a seemingly complex network of interaction among agents with limited knowledge. Hayek's elaborations on this complex, evolving spontaneous order are found in various places (e.g. 1952, 1964). Hayek continued with his work on "evolving order", linking it with his work on political and legal theory (e.g. 1960, 1973). In tackling the evolution of political, social, legal and economic institutions, Hayek is rightly conceived as one of the founding fathers of "evolutionary economics". In many ways, one can see how the work of the social "evolutionist" and skeptic philosopher, David Hume was particularly influential on Hayek. Indeed, Hayek's scholarly work on the history of economic thought - e.g. on John Stuart Mill, Richard Cantillon and the Bullionist Debates - often echoed his search for bedfellows in the past, those who had resisted the "rational", calculable worldviews and simplistic solutions ever-so-present within intellectual circles. In his work on the philosophy of science (1952), Hayek traces the intellectual roots of the rational-socialist tendencies of economics to the French tradition of Saint-Simon and Comte in the 19th Century. Hayek's efforts were nonetheless ignored in the Keynesian mainstream which then dominated economics. Finding a deaf ear in economics, he looked elsewhere. In an apparently bizarre interlude, Hayek turned his attention to psychology - turning out an anti-behaviorist (and Hume-drenched) tract, The Sensory Order (1952), which fit into his "group selection" type of evolution he had applied to his "spontaneous order" in economics. All this led to one of his most famous works, the Constitution of Liberty (1960) bringing all his previous work on political theory together into one magnificent defense of "Old Whig" political doctrine and a return attack on the Saint-Simon-Comte collectivism. Having seen his old idea of a "commodity reserve currency" (1943) fail to generate much interest, Hayek turned in the 1970s to champion the cause of a "free banking system" originally proposed by Vera Smith Lutz and the devolution of monetary control away from the central banks and into the hands of private banks (1978). This drew upon him the opposition of Milton Friedman and the Chicago Monetarists. After spending many fruitful years at the L.S.E., Hayek joined the Committee on Social Thought (not the economics department) of the University of Chicago in 1950. In 1962, Hayek left for the University of Freiburg in Germany and subsequently Salzburg, where he spent his remaining years. Hayek shared the Nobel Prize with Gunnar Myrdal in 1974 in one of the more controversial and surprising awards ever made (controversial because Myrdal had called for the abolition of the Nobel prize as a result of it having been awarded to Hayek and Friedman, and surprising for, at that time, Hayek was virtually forgotten in the economics profession). Interest in Hayek and his work increased after the 1974 award (his Nobel speech being a reiteration of his Counterrevolution thesis) and has kept on that track until today - his stock being enormously boosted by the collapse of Communism in Eastern Europe. "The Monetary Policy of the United States After the Recovery from the 1920 Crisis", 1925, ZfVS. "Friedrich von Wieser", 1926, JfNS. "Intertemporal Price Equilibrium and Movements in the Value of Money", 1928, WWA. "A Note on the Development of the Doctrine of Forced Saving", 1932, QJE. "The Present State and Immediate Prospects of the Study of Industrial Fluctuations", 1933, in Spiethoff festschrift. "The Trend of Economic Thinking", 1933, Economica. "On Neutral Money", 1933, ??? "Carl Menger, 1840-1921", 1934, Economica. "The Maintenance of Capital", 1935, Economica. "Price Expectations, Monetary Disturbances and Malinvestments", 1935, Nationalokonisk Tidskrift. "The Economic Conditions of Inter-state Federalism", 1939, New Commonwealth Quarterly. "The Facts of the Social Sciences", 1943, Ethics. "A Commodity Reserve Currency", 1943, EJ. John Stuart Mill and Harriet Taylor, 1951. The Sensory Order: an inquiry into the foundations of theoretical psychology,, 1952. "Degrees of Explanation", 1955, British Journal for Philosophy of Science. "The Dilemma of Specialization", 1956, in White, editor, State of Social Sciences. "Rules, Perception and Intelligibility", 1962, Proceedings of British Academy. "The Economy, Science and Politics", 1963. "The Theory of Complex Phenomena", 1964, in Bunge, editor,The Critical Approach to Science and Philosophy. "Kinds of Rationalism", 1965, ESQ. "Principles of a Liberal Social Order", 1966, Il Politico. "Dr. Bernard Mandeville, 1670-1733", 1966, Proceedings of British Academy. "The Legal and Political Philosophy of David Hume", 1967, Il Politico. Studies in Philosophy, Politics and Sociology , 1967. "The Primacy of the Abstract", 1968, ??? "Three Elucidations of the Ricardo Effect", 1969, JPE. Law, Legislation and Liberty, 3 volumes, 1973-79. New Studies in Philosophy, Politics, Economics and the History of Ideas, 1978. Money, Capital and Fluctuations: Early essays, 1984. Taking Hayek Seriously (formerly Hayek Scholars Page) of Greg Ransom - excellent -- massive bibliographies and links. Hayek Society page at L.S.E.